Production Master deliver “Boomin’ Hip-Hop & Trap 2” – the follow-up to one of our most sold packs to date; “Boomin’ Hip-Hop & Trap”. Volume 2 is exactly what you would expect from it! Killer vibes, fire riffs, sick presets, speaker shattering beats and dank melodies. Featuring over 101 Serum Presets as well as 300 WAV Files. “Boomin’ Hip-Hop & Trap 2” is filled with tons of killer content, both samples and presets, ideal for beatmakers, rappers and producers alike and will give you that edge to make your productions stand out. If you love artists such as Metro Boomin’, Drake, Lil Wayne, Chris Brown, Kendrick Lamar, The Weeknd, J. Cole, Future, etc, this pack is a must have! 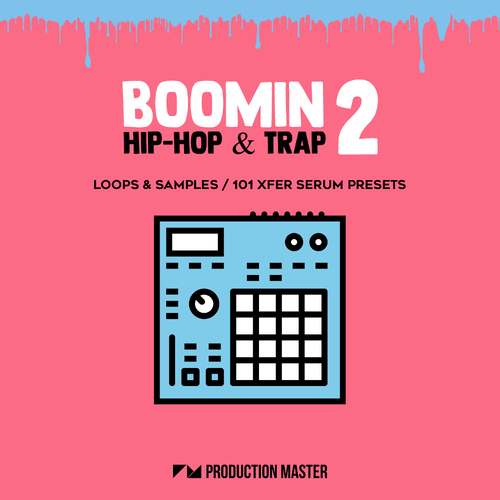 Inside Boomin Hip-Hop & Trap 2 expect to find easy to use, drag and drop full drum loops as well as bright top loops, groovy hi-hat loops, patterned clap loops, innovative ride loops and tons of one-shots such as kicks, claps, snares, closed and open hats, rides and more. Vibe along with the sick, subtle distorted 808 loops or play around with the percussions to inject your tunes with some worldly originality. Impress peers with the phat beats you will be making out of these kits! Make your tracks boomin’ with “Boomin’ Hip-Hop & Trap 2”! Grab this fire pack NOW!